Tacos are a staple in my house because we can all agree that this slow cooker chicken taco filling is delicious. This is a DUMP dinner, which means all you have to do is dump it into the slow cooker (except for chopping the garlic) and you are done cooking. I wish every recipe could be so easy but most of mine involve chopping, chopping, and more chopping. My family loves to customize their tacos which helps with the arguing over food. My daughter adds more beans and no cheese – my son adds only cheese (oh well). I skip the tortilla and simply eat this on a bed of lettuce. It doesn’t really matter what you do to this filling because chicken breast is very low in calories. The slow cooker is an easy and tasty way to cook chicken. If you haven’t tried my chinese honey garlic chicken recipe or my slow cooker whole chicken you are missing out on an inexpensive and easy mode for making a weeknight meal. 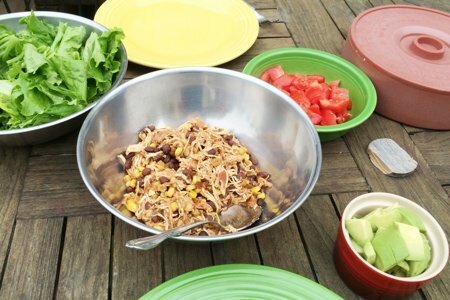 This taco filling has corn and beans with the chicken meat (which is very lean) so this is low in calories when compared to cooked ground beef. It also helps you stretch the meat so the meal turns out to be less expensive – a win-win! 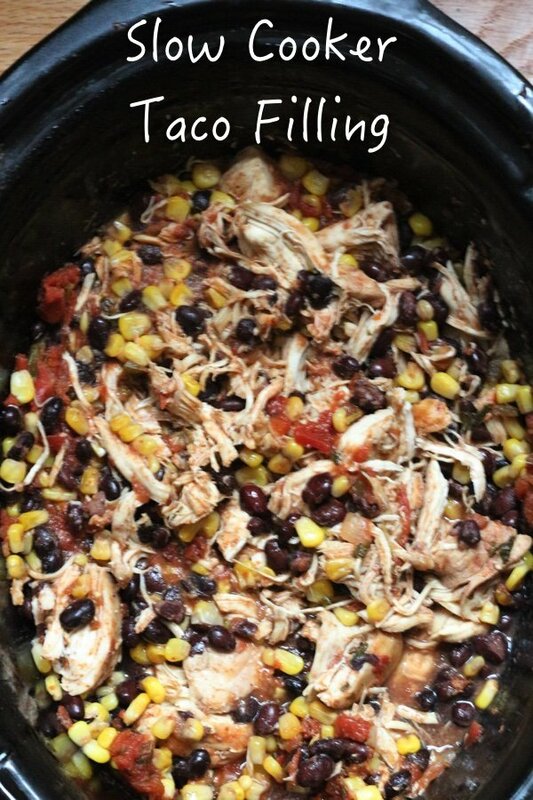 I pile the beans and corn on top of the chicken in the slow cooker so that it doesn’t dry out. This chicken is moist and I even tricked my husband (who thought it was thigh meat). Homemade Taco Seasoning - combine 2 teaspoons cumin, 1 tablespoon chili powder, a minced garlic clove, and 1/2 teaspoon of salt and use in place of packaged seasoning. Since garlic is not a traditional Mexican ingredient, we leave it out of all of out Mexican dishes. If you are going to use black beans, you should add orange juice. Black beans are an Eastern Mexico, tropical bean. Tropical Mexican food uses a lot of citrus and black beans and fish. We make all of our tacos from carnitas, roast pork. We pressure cook it and using no seasoning in this process. Once cooked we pull it and fry it on the stove top in a dry frying pan stirring often. This makes the pork crispy in the typical street taco fashion. It can also be put under the broiler but watch it closely so it does not burn. Tacos are served in corn tortillas always unless you live in Texas and like Tex-Mex food. We do and we don't. I have made this several times since you posed it before and my family all love it. My daughter does not love corn so sometimes I dont put it in and it still turns out well. It makes a ton too! I have 4 meat eaters in the house and we always have left overs that I usually freeze. Thanks for re-posting this! I used to make it all the time but have somehow forgotten about it. It is really wonderful by itself, with a grain side, cold, hot, whenever. It freezes beautifully. thanks! I am starting to pull out the slow cooker recipes and this one sounds great. Just wondering how you think this would come out if I left out the black beans? 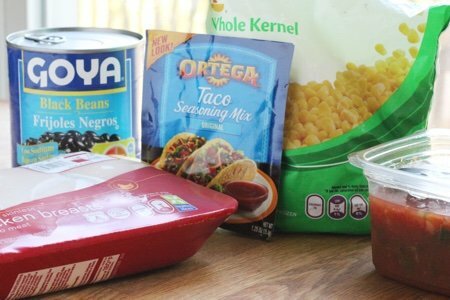 My husband and I love them, but my son won't eat anything with black beans. Would it be too dry? @Anne - I think it would still be great. I use the beans primarily to stretch the meat. Thanks for your question!